In 25 words or less: The Mariners pull off something out of the ordinary. This doesn't necessary mean they won a game or anything. This one featured Mike Mussina going up against Ryan Franklin. Would Mussina have his usual way with the Mariners? Would Franklin carry on with his post-suspension ineffectiveness? Decent. Derek Jeter flew out high to rightfield on the first pitch. Hideki Matsui whiffed on a 2-2 fastball. Gary Sheffield fouled the second pitch into the upper deck in leftfield before flying out to the track in centerfield. It's something. Ichiro lashed the second pitch into the seats in the second row in rightfield. Willie Bloomquist got ahead 3-1 before tapping a full-count pitch right back to the mound. Raul Ibañez fell behind 0-2 before clubbing a 1-2 pitch into the gap in rightcenter, but for some reason Ibañez tried to turn it into a triple, but the relay nailed him at third by about five feet. Richie Sexson lined an 0-2 pitch right to Cano. Damage control. Alex Rodriguez bounced to Bloomquist up the middle, but the throw to first barely pulled Sexson off the bag. Jason Giambi walked on four pitches. Bernie Williams got ahead 2-0 and whiffed on a full count, and Miguel Ojeda nailed Rodriguez at third by five feet. Matt Lawton popped high to leftfield on the first pitch. Meah. Adrian Beltre 9-ironed the first pitch to the track in rightfield. Greg Dobbs sharply doubled the second pitch down the rightfield line. Yuniesky Betancourt flew out to rightfield on an 0-2 pitch. Jeremy Reed rolled out to short. Passable. Jorge Posada grounded a 3-1 pitch into the hole on the right side, where Bloomquist dove for a stop and threw in time to first. Robinson Cano took an 0-2 pitch over the outside corner. Jeter chopped a 2-2 pitch to Sexson behind the bag at first, where he stepped on the bag. Squandered. Miguel Ojeda scooped the second pitch into centerfield for a single. Ichiro laced the second pitch into rightfield for a single, moving Ojeda to second. Bloomquist bunted the second pitch in front of the plate, where Mussina picked it up and threw to first, moving Ojeda to third and Ichiro to second. Ibañez walked on four pitches. Sexson took a 3-0 pitch inside, forcing Ojeda across the plate and keeping the bases loaded. Beltre popped the second pitch to Cano in shallow rightfield. Dobbs sliced the 2-2 pitch to the track in rightfield. Not bad. Matsui popped to Betancourt in front of the bag at second. Sheffield chopped a 1-2 pitch to a charging Betancourt. Rodriguez rolled a full-count pitch to Beltre behind the bag at third, whose throw had to be scooped by Sexson. More? Betancourt walked on a 3-1 pitch low and away. Reed got ahead 2-0, and Betancourt took second on the next pitch. Reed got ahead 3-0 and later push-bunted the 3-1 pitch along the third-base side, and Rodriguez couldn't come up with the handle after charging, though he probably wouldn't have had Reed anyway. Betancourt moved to third on the play, and Reed was safe at first. Ojeda just missed a 1-1 double down the leftfield line and worked a 1-2 count full, attracting pitching coach Mel Stottlemyre to the mound. Ojeda took the full-count pitch very low and away, loading the bases. Aaron Small came in for Mussina. Ichiro grounded the second pitch hard to second for a 4-6 fielder's choice, scoring Betancourt (Ojeda out). Bloomquist fell behind 0-2 before nubbed a 1-2 pitch to second for the same play, as Bloomquist barely beat out the double play (Ichiro out) as Reed scored. Bloomquist, who was more than likely out on the play, pulled up with a hamstring or quad and came out of the game (later revealed as a left hamstring strain). Mike Morse came in to run for him. Ibañez took a 3-1 dirtball for a walk. Sexson popped to shallow rightfield on the first pitch. Spiro comes out rusty. Giambi reached the Hit It Here Cafe windows high above the rightfield wall, missing the bulls-eye in the sign by only a few feet. Williams got the hitters' counts before walking on a 3-1 pitch high and away. Lawton worked a 1-2 count full before whiffing, and Ojeda gunned down Williams easily at second. Posada golfed a 3-1 pitch off the track and wall in rightfield for a double. Cano took the first pitch in the dirt, a pitch which got past Ojeda and rolled to the backstop, advancing Posada to third. Cano ended up lacing a 1-2 meatball up the middle for a single, scoring Posada easily. Jeter rolled over an 0-2 pitch, grounding to short for a 6-4 fielder's choice. Not fun. Beltre rolled over on a 2-2 pitch, grounding it to short. Dobbs ripped the second pitch into the gap in leftcenter, and he was able to take advantage of Williams' slowitude and got a double out of it. Betancourt clubbed a 2-0 pitch to leftcenter, where Williams somehow made the running catch on the track. Reed golfed the first pitch to the track in centerfield. I laughed. Matsui grounded the first pitch to Sexson for a 3-1 putout. Sheffield took a four-pitch walk. Rodriguez worked a 1-2 count full before walking on a pitch low and away. Matt Thornton came in for Franklin. Giambi smashed a hanging slider off the facing of the suite level in rightfield. 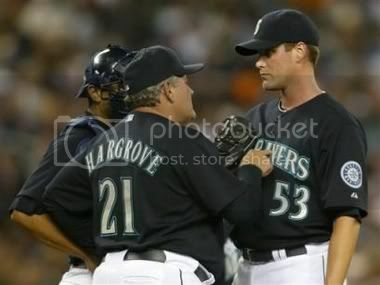 Williams walked on four pitches, then Mike Hargrove came out to the mound and grilled Thornton pretty hard. Lawton chopped the second pitch to third, moving Williams to second. Posada rolled out to short. Nothing. Ojeda worked a 1-2 count for a walk. Ichiro popped the second pitch high to Cano in shallow rightcenter. Morse grounded a 3-1 pitch into a 4-6-3 double play. Holding the fort. Cano bounced the second pitch to short. Julio Mateo came in for Thornton. Jeter whiffed on a 1-2 pitch. Matsui doubled into the rightfield corner. Sheffield popped the second pitch high to centerfield. Same crap. Ibañez bounced out to second. Sexson popped the second pitch just short of the track in centerfield. Beltre got ahead 3-0 before walking on a pitch inside. Dobbs popped an 0-2 pitch to Giambi in front of the bag at first. Daggers. Rodriguez crushed the first pitch into the Mariner bullpen in leftcenter. George Sherrill came in for Mateo. Giambi whiffed on a high 1-2 fastball. Williams fell behind 0-2 before flying out high to Betancourt in shallow rightfield. Lawton crushed a 3-1 pitch about twelve rows into the rightfield seats. Posada popped the first pitch to Sexson on the infield grass. Tom Gordon came in for Small (in the field, Tino Martinez came in for Giambi and Bubba Crosby came in for Williams). Betancourt whiffed on a 2-2 dirtball (2-3 putout). Reed flew out to Jeter in shallow leftfield on a 1-2 pitch. Ojeda got ahead 3-1 and wound up whiffing on a full count. Shigetoshi Hasegawa came in for Sherrill. Cano bounced the second pitch to Sexson behind the bag at first (unassisted). Jeter popped short of the track in rightfield on a full count. Matsui grounded along the third-base line to Hasegawa, whose throw was picked by Sexson at first. Mariano Rivera came in for Gordon (Felix Escolona came in for Rodriguez). Ichiro drove the second pitch into rightcenter, where Crosby came down with it. Morse whiffed on a full-count pitch outside. Ibañez worked an 0-2 count full before whiffing. Ballgame.